The Town of Leesburg has asked the county to pay for the police officers in Leesburg schools, but the county isn’t so sure. Currently, middle and high schools in Leesburg are patrolled by Leesburg police officers, although the county pays 70 percent of the cost for those school resource officers. 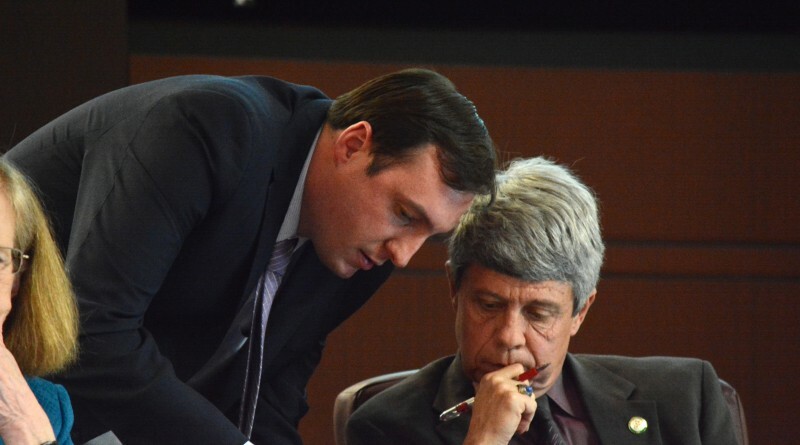 Leesburg Mayor Dave Butler penned a letter dated March 8 to the Loudoun Board of Supervisors to ask the county to pick up the remainder of that cost. Supervisors say they saw that letter only minutes before a budget worksession on March 10. Supervisor Tony R. Buffington (R-Blue Ridge), who has been appointed to a joint Leesburg-Loudoun police committee, was skeptical. Supervisor Matthew F. Letourneau (R-Dulles) said that if Loudoun is going to pick up the tab, the money should be used to hire the seven positions at stake for the Loudoun County Sheriff’s Office. “If it’s going to be 100 percent county, I want to see the sheriff’s office in there,” Letourneau said. Loudoun County Sheriff’s Office Lt. Col. Robert Buckman agreed that seven new Loudoun County school resource officers—one sergeant, six SROs, and equipment and vehicle costs—could help a lot. “It looks to me like there’s seven pink slips in this proposal, and I don’t think they [town council members] understand that,” Buona said. Overall, the SRO program in Leesburg costs $872,000, of which the county pays $665,240. 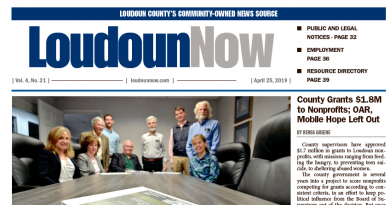 Loudoun would pay for the program with the money it already sends to Leesburg, plus moving money from the gasoline tax and the fleet replacement fund for vehicles. Staff says this would mean no net fiscal impact to the county, although if the county decides to place Loudoun deputies in the schools, Leesburg would lose both the $665,240 the county contributes to Leesburg SROs and $587,462 in gas tax funding the county would reallocate away from the town to pay for the new SROs. Overall, this would mean the county no longer sends $1,252,702 to the town. The board tabled the question while former Leesburg mayor Supervisor Kristen C. Umstattd (D-Leesburg) communicates the board’s concerns to the town. If the Sheriff takes over the SROs, then yes, seven Leesburg Police officers would either have to be reassigned at town expense, or laid off. The town would save $220,000 or so in that regard. The fact is the Supervisors are not going to take over the program unless a brown uniform is in these schools. The Sheriff’s office welcomes this, as it would beef up their resources in the summer. But during my time on Council, the Leesburg PD SROs spent a lot of the summer working in program former Chief Price had with at-risk youth. It was a free summer program for these kids at police HQ. So, they did not do much regular police duty, but that could have changed. Let’s look at this carefully. It is painfully clear, for anyone who took the time to watch this topic on the Town of Leesburg webcast, that Tom Dunn and Katie Hammler were posing for the cameras, looking toward their re-election efforts, and did not give one second of thought to what they were doing. For about $200,000, the Town of Leesburg had seven police officers on staff. The rest was being paid for by the County. Sounds like a great deal to me. But, apparently, not to Tom Dunn and Katie Hammler. REALLY! I shake my head at the total lack of, dare I say it, intelligence, on the part of Tom Dunn and Katie Hammler. Those two really have to go, and hopefully with the upcoming Town elections this November, both will be ushered out the door. Dunn laid it out pretty clear at Saturday’s budget meeting. The town would not layoff officers due to a 13 (I think was said) officer shortage. What I did not like is seeing Council cave so quickly to the BOS threats lead by Bonehead Buona who is quick to jump on anyone taking money from his district. It was hard to hear everything on TV but the cost is $800000 yet the Bonehead wants to hit the Town by taking $1.4 million. But that is the kind of fairness you get from the GOP BOS lead a Bonehead. Gee, isn’t it funny how Ol’ sounds sooooooooooooo much like Tom Dunn. I guess birds of a feather, eh. But, the point that has not escaped us, is that Tom Dunn clearly continues to endanger over a million dollars in funds that the County pays out to the Town. I guess his ego, at being told he was a fool, does not like being bruised like that. I wonder how many more stunts Tom Dunn will try to pull, from now until November, to ruin singlehandedly the Town of Leesburg’s relationship with the County.